This is a very nice documentary on the Great Fifth Dalai Lama. All the dalai lamas have the same mindstream and the great fifth after initial reservations realised he was wrong about dorje shugden. 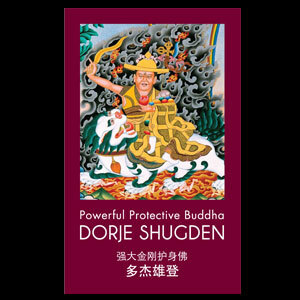 So how can the 14th Dalai Lam not know of dorje shugden qualities and that the protector is fully enlightened. Very encouraging South America is ripe for Lama Tsongkhapa's tradition! People who practice in South America do take note ! Thiago Nunez - Speculation or truth? Did the Dalai Lama took the decision on retirement owing to uncertainty over his successor? DHARAMSALA: With the exiled Tibetan Parliament accepting formal proposal of the Dalai Lama's retirement from political responsibilities was, however, the question remains that the Dalai Lama took this decision owing to the uncertainty over choosing his successor. Since the traditional practice and method of choosing the successor of the Dalai Lama is very long and painstaking as the priests have to find out and search for omens, portents and meteorological signs. The task of choosing successor to the Dalai Lama could take number of years. The traditional method of choosing the successor of the Dalai Lama could take 15 to 20 years which was a very long period, the uppermost question in the minds of the Tibetans was that what would happen to the Tibetan cause in the event of the vacuum created to find out or identify the next successor of the Dalai Lama was understandable. Perhaps due to this, the Dalai Lama in order to dispel such uncertainty among the exiled Tibetans made the decision to announce retire and pave the way for transfer of power to the elected head of the exiled Tibetan government. The de facto Prime Minister of Tibet, Samdhong Rinpoche said that said that the Dalai Lama realizing the situation and all pros and cons set-up a political leadership in the form of exiled Tibetan administration in 2001 with the Prime Minister and members of the exiled Tibetan parliament being elected directly through elections with the exiled Tibetans living here and in other parts of the world take part in the voting exercise. Meanwhile, the deputy speaker of exiled Tibetan Parliamnet, Dolma Gyari said that efforts were being made to ask the Dalai Lama to assume some sort of advisory or mentoring role for the exiled Tibetan government. She said that the redrafting committee would have likely 5 members which would present its report on the changes to be made in the Tibetan charter by April 11. 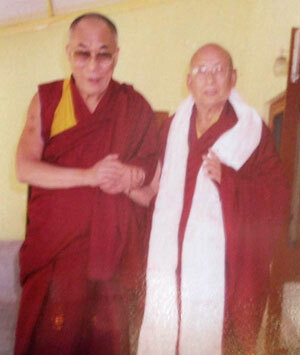 PLease do not misrepresent the Dalai Lama especially if you are a student of his. There is already enough misrepresentation of him all over the web. The people who frequent this site believe very strongly that the Dalai Lama has a role to play in the promotion of Dorje Shugden. Tibetans in India may not be free but that is not the case for all over the so called free world, people can actually make a choice! Being true to our vows and commitments is the crust of the matter. Hence the emergence of www.dorjeshugden.com (438,949 views as of today) and our Dorje Shugden facebook page (http://www.facebook.com/home.php#!/GyelchenDorjeShugden). We feel there are many silent participants who agree with us. We want the ban to be gone, but we will believe in the bigger picture as spoken by Kyabje Trijang Rinpoche. Overall better for our individual practices to have this view. We are not against Dalai Lama nor wish to disparage him as we have our vows, but we will promote Dorje Shugden to show the other side of the coin of this sacred practice. We do not agree with Dalai Lama's ban, but we do like some of the other works he has done. No one in this world has a perfect track record. To point someone out and penalize him and overlook everything else he has done is not fair. Look into ourselves and see what we have done and the results of our lives. Have we made mistakes, been hypocritical in the past knowingly and unknowingly? 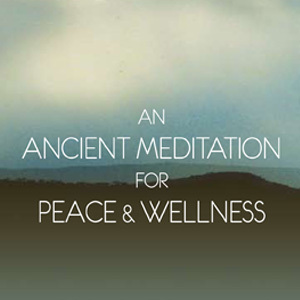 Do we have problems now that impair us from doing more as a result of our negative karma coming back? We all do. Obviously you are someone living in Switzerland making all kinds of comments of which half most of us cannot understand. You may be a Tibetan and follow Dalai Lama as your leader, but not the whole world does. What Dalai Lama does is undemocratic and wrong. If you do not like democracy, do not live in Western countries. Stay in India under the Dalai Lama. Ok, I see that you love so much Dorje Shugden so tell me, how can he be a fox a beautiful woman and man at the same time? Magic, even with your whole practice you are completely blind. I’m sorry that you have to learn this from some one who`s not a Buddhist.Hh the Dalai Lama told you already to stop and you still dont lesson. You keep lying to sentient beings and to your selfs maybe you like fire. spencer you got a point there, all countries need strong leaders. Indonesia for example we had our currency devalued during the currency crisis and we sold a lot of our national assets. In the hands of our elected president we managed to recover and strongly too! I hope the new TGIE PM will have the courage to end this ban once and for all. Tibet is a lost cause China has no need to give it back! My business trip to Bangkok yielded in the discovery the Dorje Shugden in Thai. I have paid scant attention to Tibetan Buddhism all this while till now. 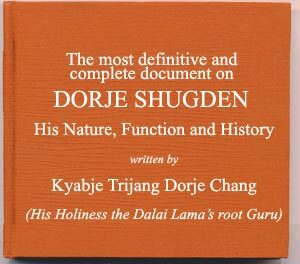 True dorje Shugden is related to a controversy, but the potential to benefit is so so mich more. I'm willing to bet that 99% of all gelug lamas cannot be wrong in propitiating this protector. I recall watching a lama's talk recently that without the dharma protectors buddhism would not grow as much. This is an extremely informative discussion on the mechanics of an oracle taking trance and how an oracle is chosen. Everyone should spend soem time looking through this thread. Much knowledge from the forums. Wisdom Being, I like your thoughts and hypotheticals. I believe if Tibet was not invaded, the dharma would still spread but much slower and not as mainstream. The Tibetan govt are a very closed group of ppl in the past. In the early 1900 before the invasion they banned most of the foreigners who wished to visit Tibet. They refused diplomatice ties with many. A few like Anagarika Govinda and Alexander David Neel had to disguise their way in. Stayed undercover throughout their whole journey in Tibet. A few also did get permission but not many. Tibetans and especially the then Tibetan govt were very xenophobic. The Tibetan govt are open now and welcome any diplomatic ties and connections to the rich, big and famous because they need financial and diplomatic support. Because of their mishandling of their country, they lost it. It's been embarrassing for them to have no headway in their negotiations with China. China is smarter than anticipated by the Tibetans. 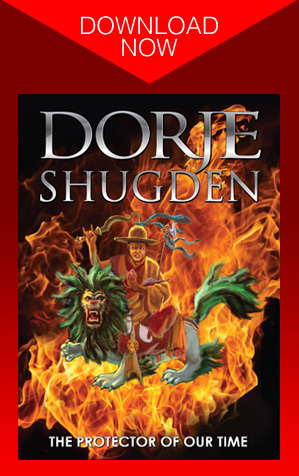 Most likely Shugden's practice would not have been banned as there is no reason for the ban. If Tibet was not invaded, Dalai Lama would have full power of authority with no dissension therefore no need to ban Shugden. Shugden has been banned for partially political reasons and then of course the spiritual reason. 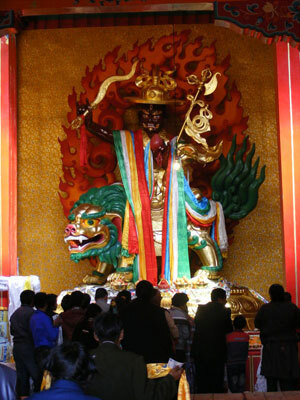 Shugden is blamed for all the mishaps that occur within the exiled Tibetan community as illogical to karma as it sounds. Shugden is blamed for not gaining headway with China Talks. 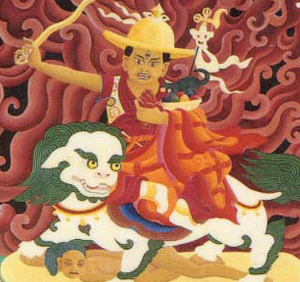 Shugden is even blamed for potentially threatening the long life of Dalai Lama. 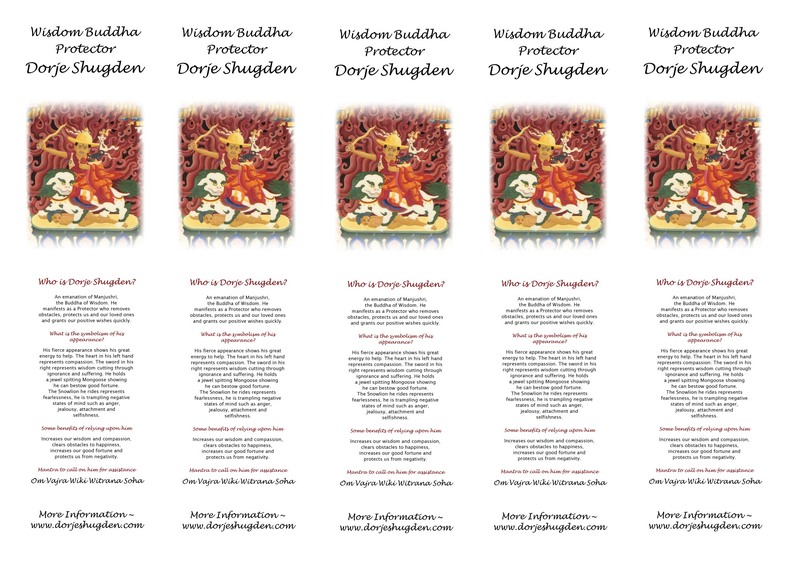 In short, Shugden is a 'great' scapegoat. * Trijang Rinpoche already predicted the obstacles that would arise and how Dalai Lama and Shugden would work hand in hand to make the practice enormous in the world. Trijang Rinpoche clearly said, it may not appear Dalai Lama is helping Shugden practice to grow, but it is only appearance. All the pro and anti Dalai Lama/Shugden sentiments are only temporary. 2,000 years ago Christians were fed to the lions for five hundred years and accepted as the correct thing to do among the Romans. Well now Christianity is a dominant force. Likewise who knew the persecution against the early Christians would fuel the underground Christian movement of those times and make Christianity what it is today. Similarily, the persecution Shugdenpas feel today by the Dalai Lama is all part of the plan. The protests, Geshe Kelsang's stance, Trijang Rinpoche's volume on Shugden, this website, many other websites, Tibetan Govt's childish behaviour, etc etc are all part of the grand scheme of things. A few decades later, a few hundred years later all this will be forgotten and Shugden's practice prevails. *just imagine the rise of Nazi's are blamed on Mother Mary. The death of Martin Luther King is blamed on his guardian angels. Or Gandhi's death is blamed on Shiva' lack of protection. Nelson Mandela's two decade imprisonment is St Michael's fault. Imagine if all world leaders blame mishaps and potential/actual assasinations as the fault of mystical non-physical entities as does the superstitious-minded Tibetan govt. Why would Dalai Lama attribute problems within the Tibetan community as arising from Shugden and the peasant Tibetans believe it? There are those who believe Dalai Lama is enlightened and a much larger group in the world that do not. 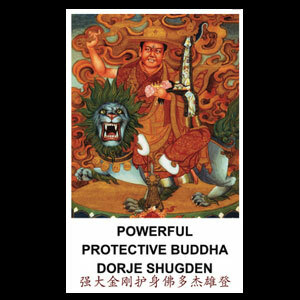 So for those who do not, Dalai Lama should not ban the practice of Dorje Shugden as it makes him look tyrannical and undemocratic. Visualize Obama, Thatcher, Gandhi and their likes all banning one form of religious worship in their respective countries. How would that look? If it does not look good for them, it will not look good for Dalai Lama. What thaimonk mentioned about the new leadership is a mouth watering option. Sometimes leader when they come into power they need to show they can lead and make decisions. What better decisions than to heal wounds and reunite all Tibetans under one leadership! he will be remembered for a long time for taking such a bold step. I pray the future prime minster would have the foresight to puts many skeletons to rest and forge ahead with a new Tibetan identity leave the old baggages behind. It will be a time of reconciliation and growth for the entire Tibetan society in exile. Can't wait to see how this unravels..
Thats is true, I didn't correlate that at all. So Karmapa won't be the head of Tibet after all, politically or spiritually. It was all shadow play. And neither is Kyabjye Ling Rinpoche mentioned as well. So much for the succession video on youtube earlier. An old thread on the forum with such beautiful pictures of Trijang Lama, in awe looking at the thangkas. Dalai Lama would compose praises to Dorje Shugden and Kache Marpo and then later would say they are spirits and we shouldn't pray to them. Is there a difference in the Dalai Lama before and after the compositions? Isn't it the same mindstream? After the Karmapa money scandal, I don't hear about him 'succeeding' the Dalai Lama anymore. Now it's let's elect our leaders. Even the Dalai Lama is handing his power over to newly elected lay officials and not Karmapa although I don't think Karmapa was ever part of the real equation of succession anyways. It was just speculation. Why would all sects follow Karmapa? Not viable. Does anyone else notice after the big money scandal all has been quiet about Karmapa succession speculations? It is truly good news Dalai Lama will withdraw from politics. It couldn't get any worse than now I figure with new leadership coming in. Some of the policies of Dalai Lama like many leaders around the world make a sector in their society suffer. Everything is endurable, but not religious/spiritual persecution. When you take people's spirituality away they are just a shell of a person. A shell of a person eating, sleeping, making money, playing, procreating, aging and death. No meaning, no substance, no real end nor real purpose. Any democratic ruler, leader or govt body should allow full religious freedom to choose their path without interference from the authorities whatsoever. 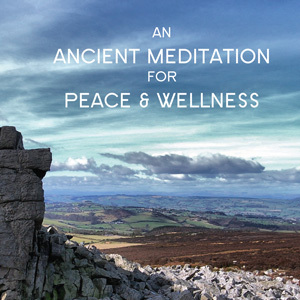 Healthier that way and for long term cohesion of a pluralistic society. The Dalai Lama will need face and he cannot withdraw his ban on Dorje Shugden, but if the new Tibetan leaders officially and repeated ask him to lift the ban there would be a good chance he would. If they actually begged, he might say well since you all choose this, go ahead. You never know. Even the Dalai Lama's authority needs face. So if the new govt for societal cohesion purposes decide to work toward lifting the ban, it is a great possibility it could be lifted. After all in Europe of the past, the popes were very powerful, till secular elected govts took over each European country one by one and announced freedom of religious choice. You do not have to be a Catholic as the pope had deemed. For hundreds of years in some European countries to be a non Catholic was to be assured a place in hell as you were a herectic. We wouldn't believe that now. The ban has to lift or has to just fade. The new leadership will be hope toward that goal.